Polls have opened in a fourth attempt in recent months to hold run-off presidential elections and end political unrest. Polls have opened in the Maldives fourth attempt to hold run-off presidential elections that the island’s 240,000 voters hope will bring an end to two years of political turmoil. “Voting started across the Maldives and several foreign capitals where Maldivians live,” Elections Commission official Aishath Reema told the AFP news agency on Saturday. “People lined up to vote long before polling booths opened,” she said. Polling booths in the Indian Ocean archipelago opened at 7:30am (0230 GMT) with the electorate given eight and a half hours to choose between two candidates. After an annulled result and two cancelled polls, foreign diplomats have increasingly viewed delays as politically motivated and the European Union warned of “appropriate measures” if Saturday’s election did not go ahead as scheduled. Mohamed Nasheed, who became the Maldives’ first democratically elected president in 2008, left office last year in what he says was a coup. He won 47 percent of first round votes a week ago, short of the 50 percent needed to avoid a run-off. He is up against Abdulla Yameen, a half-brother of Maumoon Abdul Gayoom, who ruled the holiday island paradise for 30 years and is considered a dictator by opponents and rights groups. The term of the incumbent president, Mohamed Waheed, expired on Nov 11, but when the Supreme Court delayed the second round of voting after demands by Nasheed’s rivals, Waheed extended it to fill a constitutional void. The political upheavals and sporadic violent protests in the capital Male have hit tourism, a vital source of foreign currency, notably resulting in the Maldives being unable to import all the fuel it needs. Political analysts say the crisis may not pass even if the vote goes smoothly, after a bitter election campaign centring on the future role of religion in a largely Muslim state where Islamist ideology is on the rise. Addressing a final rally on Thursday, Nasheed said his opponents were using Islam as a weapon, after they accused him and his Maldivian Democratic Party (MDP) of being too secular and close to Western countries. The Football Association of Thailand’s Electoral Committee yesterday decided against approving Worawi Makudi’s presidential election win that would have seen him retain the post for a fourth consecutive term. Worawi, 62, won Thursday’s poll with 42 votes against challenger Virach Chanpanich’s 28 and was set to keep a post he has held since 2007. But three of the five-member Electoral Committee were unconvinced by Worawi’s claim that the poll was the FA’s “cleanest” ever, after the vote was held five months late and marred by several allegations of irregularities. One such was the dispute over voting rights for six of the 72 clubs eligible to vote, with allegations that outsiders had been drafted in to take the place of the six clubs’ own representatives in the election. A sudden change of the entire appeal committee that oversaw the six clubs’ case stirred further rumours of corruption. Electoral Committee member Chanint Kaenhiran yesterday called a conference at the Golden Tulip Sovereign hotel, the same venue that hosted the election, to explain that he and two other members including the chairman had not approved the result because they believed the vote was unjust. “As someone who has conducted elections, both nationally and locally, for four years, I found it difficult to approve the result yesterday. We had a case in which people were taking the place of the clubs’ representatives. “On the eve of the poll, we held a hearing for those clubs in dispute over voting rights and made a ruling on each case. Our decision was based on Fifa criteria that call for priority for people from the club’s management. “However, just a few hours before the election, the ‘new’ appeal panel decided to reverse our ruling without reasonable explanation. Then, they failed to check whether the clubs in question wanted to appeal the decision. “We also saw the change of the appeal committee as lacking transparency, so we were unable to approve the outcome” of the poll, said Chanint. Chanint said that Thursday’s result would now be put before the Sports Authority of Thailand (SAT), who would decide whether to approve it or not. Worawi, meanwhile, is reportedly continuing to insist that his election was free and fair, as witnessed by representatives of Fifa and the SAT. He appealed for the matter to be closed and for his opponents to show sportsmanship. He added that Fifa and the SAT had already asked Thai FA to submit its new executive board. Virach, however, claimed the election was not transparent and that politics had been used to influence voting. Football fans have taken to the Internet to express their discontent at the outcome of the election, with one group launching a petition calling on Worawi to resign after his poor record as reflected by the national team’s form. Many also believe the poll lacked transparency and was riddled with irregularities that spoke of corruption. Voting has begun in Germany’s elections, with Chancellor Angela Merkel vying for a third term in charge of Europe’s most powerful economy. Polls suggested Mrs Merkel’s Christian Democrats may take the largest number of seats in parliament, or Bundestag. But Mrs Merkel’s coalition partners, the Free Democrats, may not gain the 5% vote share required to win any seats. If so, Mrs Merkel may have to consider a coalition with her main rival Peer Steinbrueck’s Social Democrats. A coalition of Centre-Left, Left and Green parties is also a possibility. Voting opened at 08:00 local time (06:00 GMT) and is due to close at 16:00. Elections in Germany are often followed by a period of several weeks of coalition talks before the final shape of the government emerges. On Saturday, the main parties concluded their campaigns with large rallies. In Berlin, Mrs Merkel asked for votes to continue with her government’s policies into 2017. In Frankfurt, Peer Steinbrueck – who leads the opposition SDP, told his supporters to believe in the possibility of victory. The Green Party – who may play some part in an eventual governing coalition – has criticised Mrs Merkel’s government for raising taxes. The Free Democrats (FDP), whose best-known member is Foreign Minister Guido Westerwelle, has seen its fortunes decline sharply since the last election in 2009, when it won nearly 15% of the vote. Analysts say the party, traditionally more liberal than the CDU/CSU, has struggled to stand out from its more powerful coalition partner on economic policy. If the Free Democrats (FDP) do badly, as expected, the Christian Democrats (CDU/CSU) may find themselves looking to other small parties to form a broader, more fragile coalition. According to an average of opinion pollstweeted by the ‏London-based @electionista monitoring site, the CDU/CSU will get 38.6% of the vote to 25.8% for the SPD and 6.4% for the FDP. 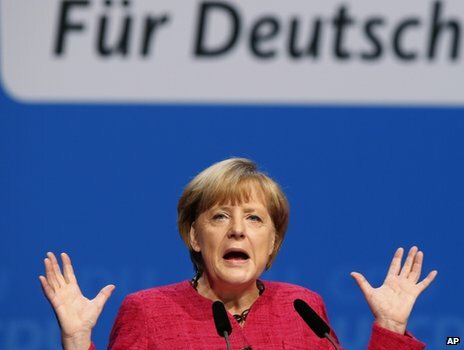 Some analysts also see the possibility of a government led by Mrs Merkel which includes the Social Democrats (SPD), whose leader served as finance minister under Mrs Merkel in a previous grand coalition. Under another scenario, a new party largely formed from disaffected CDU members could get enough votes to be regarded as a different coalition partner. Alternative fuer Deutschland (AfD), as it is known, is avowedly anti-euro and could prove a difficult partner. The election is one of the most important in years because of Germany’s dominant role in the eurozone. With the biggest population of any EU state, it enjoys a GDP that far outstrips the economies of its partners and is crucial to decisions on tackling the eurozone’s debt crisis. Cambodia’s opposition party says it narrowly won Sunday’s general election, challenging the ruling party’s earlier declaration of victory. Hours after the poll, PM Hun Sen’s ruling party said it won 68 seats in parliament to the opposition’s 55. But opposition leader Sam Rainsy said the result was 63-60 in his favour, and called for an independent commission to investigate poll irregularities. Official poll results are not expected until mid-August. Hun Sen has been in power in Cambodia for nearly three decades. The national election commission is widely expected to back his Cambodian People’s Party (CPP), says the BBC’s Jonah Fisher in Bangkok. But the opposition Cambodia National Rescue Party says it does not accept the results. Earlier this week, it cited multiple irregularities with voter lists. Sam Rainsy told the BBC that the opposition would not take its seats in parliament – expected to sit in September – until its win was recognised, which would prevent a new cabinet being approved. “We expect the CPP to concede the election to us. The information we have received from the our activists and party agents show that we have won 63 seats and they have won 60,” he said. Ouch Borith, Cambodia’s secretary of state at the Foreign Affairs Ministry, on Tuesday rejected claims of voting irregularities. “We have over 10,000 national observers and over 100 international observers who reckoned our election was held in a peaceful manner without any violence, free and fair,” he said. Both the US and the European Union have expressed concern over the conduct of the polls and have asked the election commission to conduct an investigation. “We are concerned by numerous reported irregularities in the electoral process,” US State Department spokeswoman Jen Psaki said on Monday. She added that Washington had long highlighted “systematic flaws such as problems in the voter registry and unequal access to the media”. The result announced by the CPP represented the worst result for the ruling party in 15 years.